Thanksgiving is around the corner. 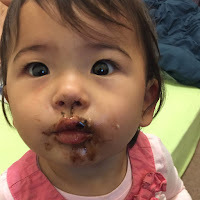 Usually, I love to make pies for dessert. And there will be pie. Lots of it. But sometimes it is fun to do something different. I like to use the Thanksgiving season to experiment with new fall recipes. A little while back, I discovered patterned cakes on Pinterest was instantly intrigued. Pretty patterns + baking = LOVE. They are just so pretty. 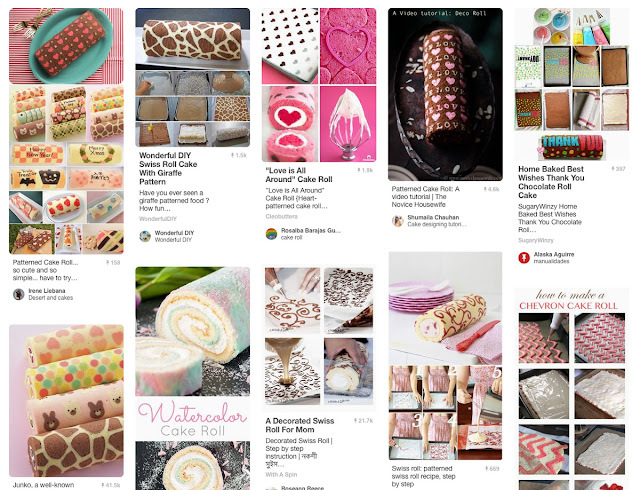 Pinterest search for "patterned cake roll"
Basically, it is a swiss roll cake where a design is drawn out with different colored cake batter before pouring the rest of the batter into the pan, so it creates a design on the cake. This was the first one I attempted. It was a basic yellow cake with strawberry jam and whipped cream filling, so the pattern was appropriately themed. This would be a nice addition to a Thanksgiving table. The extra effort to create such a pretty presentation are perfect for special occasions. The link to download the printable recipe is below. 1. Preheat oven to 375°F. Grease a 15.5 x 10.5 inch jelly roll pan. 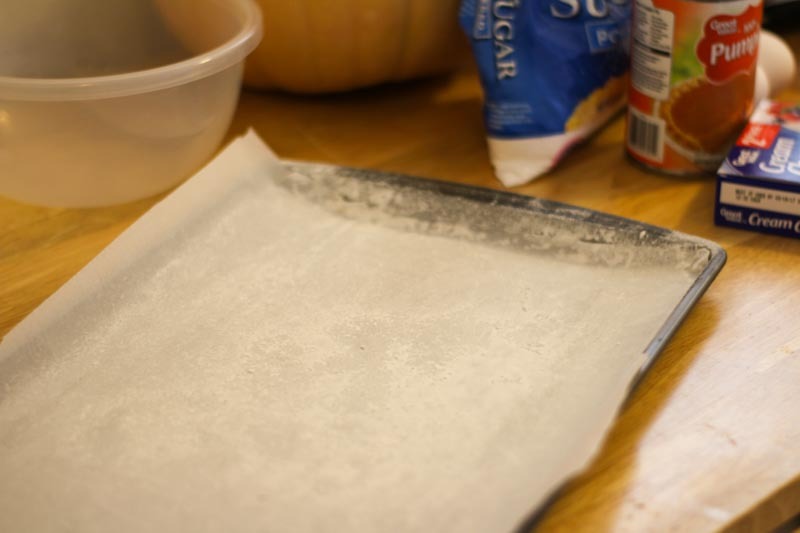 Line with parchment paper and grease and flour the paper. 2. 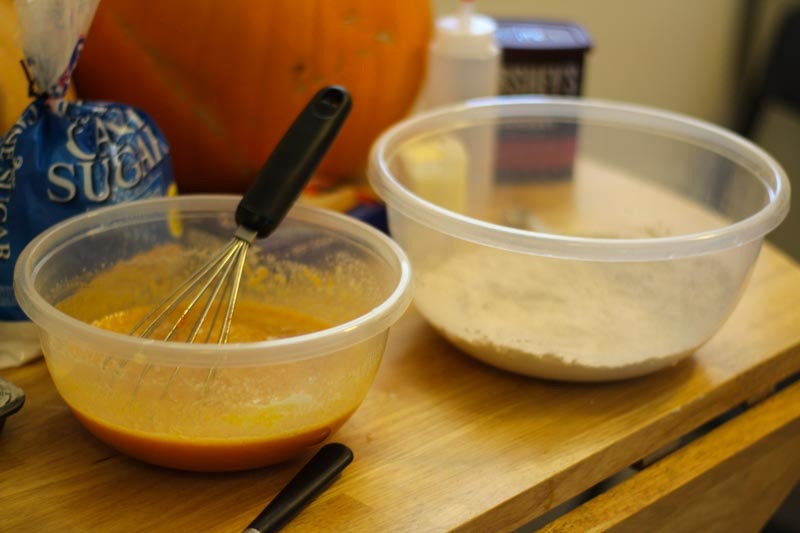 Combine the flour, baking powder, baking soda, cinnamon, pumpkin pie spice, and salt. Set aside. In a larger bowl, beat together the eggs and sugar. 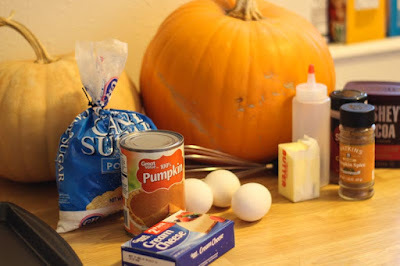 Add the pumpkin and mix well. Stir in the flour mixture. 3. Reserve 3/4 cup of the batter and add the tablespoon of cocoa. 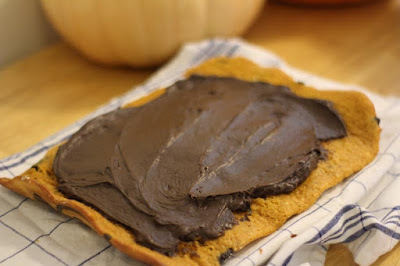 Place chocolate batter into a squeeze bottle or piping bag. Create your design on the prepared parchment-lined pan. 4. 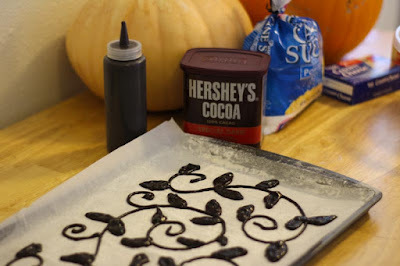 Bake the chocolate pattern for just a few minutes in the oven until the design begins to set. 5. Pour the remaining pumpkin batter into the pan over the design and spread evenly. Bake for 13-15 minutes until the cake springs back when touched. 6. Immediately turn cake out onto a baking rack covered with a clean towel that has been sprinkled with powdered sugar. Carefully remove the parchment. Cool slightly, but not completely—just so it can be handled more easily. 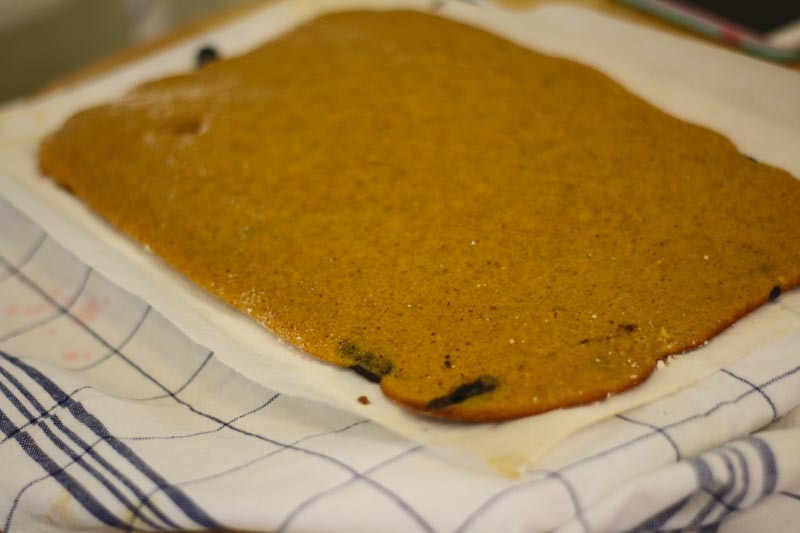 While still warm, flip over again onto a clean parchment lined pan so the design is face down once more. Roll up the cake with the parchment (from one of the shorter ends) and let cool further. 7. For the filling, beat together the cream cheese, butter, powdered sugar, cocoa, and vanilla until smooth. 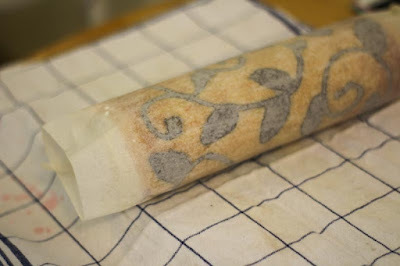 Carefully unroll the cool cake. Trim off the thinner, harder edges to even out. Spread the filling over the top, without going all the way to the edges. Roll up the cake once more with the filling, placing the end at the bottom to keep it from unrolling. Trim the ends for a clean, neat look if needed. 8. Cover and chill to set the filling. Bring back to room temperature before serving if desired.